I wrote a blog last year on the excellent New England Journal of Medicine Oxford CDI study, which showed that a surprisingly high proportion (45%) of new CDI cases were genetically unrelated to recent CDI cases. This is not quite the same thing as evaluating how much CDI is hospital-acquired, mainly because the test used to detect CDI in the study has been phased out due to poor sensitivity, patients and staff were not screened for asymptomatic C. difficile carriage, and the environment was not sampled, so there was a large, unrecognized, hospital-based C. difficile reservoir from which horizontal transmission almost certainly occurred. A study published at the end of 2013 provides evidence that one of these potential reservoirs for transmission – asymptomatic carriage by other patients – is substantial. The study was performed by a team from the University of Pittsburg Medical Centre. All patients screened for VRE during 5 months in 2009 were also screened for C. difficile carriage. Stool samples from symptomatic patients were also cultured. All toxigenic C. difficile were typed by multilocus variable number of tandem repeats analysis (MLVA). A total 56 C. difficile isolates from symptomatic CDI cases defined as healthcare-associated (HA-CDI) were available for typing. In addition, toxigenic C. difficile was identified in 226 (7.5%) of 3006 patients, and these isolates were also. Of the 56 HA-CDI isolates, 30% were genetically related to isolates from symptomatic cases, 29% to isolates from asymptomatic carriers, and 30% were unrelated to other isolates (Figure). Figure. Proportion of HA-CDI cases genetically related to isolates from symptomatic cases, asymptomatic carriers and unrelated to other isolates. The study provides a somewhat skewed view of asymptomatic C. difficile carriage since only patients considered at a high risk of carrying VRE were screened (admissions from other hospitals, ICU patients and long-stay inpatients). This meant that 75% of admissions were not screened for C. difficile carriage. Symptomatic cases are often described as the “tip of the ice berg”; in this study, three quarters of the ice berg remained submerged. The authors performed an environment survey in the rooms of six asymptomatic C. difficile carriers and found that 5/6 rooms (48% of 25 sites) were contaminated with toxigenic C. difficile. And this is in a hospital that routinely uses bleach for disinfecting patient care areas! It’s interesting to note that transmission appeared to occur from the prior room occupant in 4/56 (8%) of HA-CDI cases, two of which were from asymptomatic carriers. Another finding was that 158 patients had CDI diagnosed during the study period but 22% of these were counter-intuitively classified as carriers. This is perhaps because the lab performed a cytotoxin cell culture assay from both formed and unformed stools. We need to apply the “no diarrhea, no diagnosis” rule! One other consideration is the molecular typing method used: MLVA. This is less discriminatory that the whole genome sequencing (WGS) used by the Oxford team. With WGS, strain relatedness is a question of how many single nucleotide variants (SNVs). With MLVA, it’s a question of distance of separation on a phylogenic tree. But you have the same fundamental problem: how do you define genetic relatedness? In reality, strain relatedness is an arbitrary line in the sand and our understanding of molecular clock speed is a work in progress. So, is it time to screen and isolate asymptomatic carriers of toxigenic C. difficile? One of the arguments against this is that “asymptomatic carriers don’t have diarrhea, so therefore, don’t shed much C. difficile”. However, the environmental findings of this study, and others, suggest that asymptomatic carriers shed almost as much C. difficile as do symptomatic cases. I expect to see some controlled studies in the near future that should provide outcome data to help us to decide whether to pull the trigger on screening and isolation for asymptomatic carriers of toxigenic C. difficile. 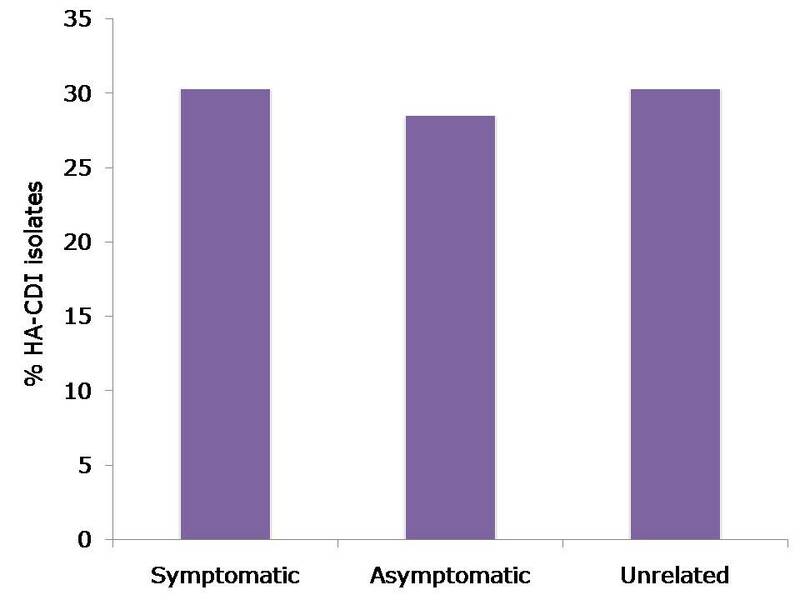 Despite sampling only 25% of the asymptomatic carriage ice berg, apparent transmission from symptomatic CDI cases and asymptomatic C. difficile carriers was approximately equal. Plus, the study did not consider staff carriers or ancient environmental reservoirs. Thus, it seems that the large majority of C. difficile is acquired in hospital, but not necessarily from symptomatic CDI cases. Article citation: Curry SR, Muto CA, Schlackman JL et al. Use of multilocus variable number of tandem repeats analysis genotyping to determine the role of asymptomatic carriers in Clostridium difficile transmission. Clin Infect Dis 2013; 57: 1094-1102. Thanks for your interest in our work. Nicely done summary. The reason we use MLVA is cost, by the way. Our UK colleagues are sold on the utility of WGS to type C. difficile, the costs ($500 US per isolate) are prohibitive, and we have the additional problem of a bottleneck in analysis capacity for WGS data. In contrast, MLVA costs $40 per isolate and allows studies like this be done on a very reasonable budget without terabytes of sequencing data to store. Thank-you Scott for taking the time to comment. I am sold in principle on the idea of WGS for C. difficle etc but I agree that the actual sequencing is now the easy part – it’s a question of who is properly tooled to analyse the data. I would be interested in seeing some work on the ‘diagnostic sensitivity’ of WGS vs. MLVA (etc) combined with cost and real world turnaround time in terms of strain typing. In many circumstances, it may be that WGS is not quite ready for adoption outside of large well-funded academic groups.